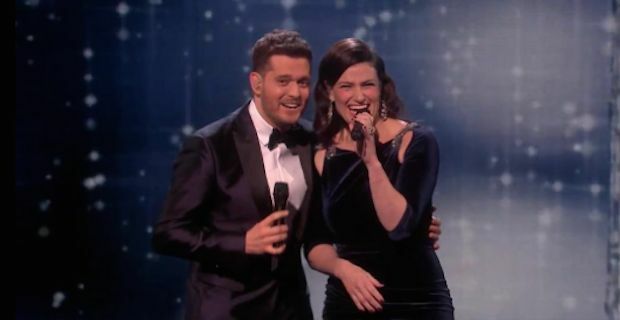 The guest performers on the semi final of the X Factor certainly did not disappoint this weekend as Idina Menzel and Michael Buble warmed everybody right up in preparation of Christmas. The duo sand Baby It's Cold Outside and got a standing ovation from the audience at the end. Viewers were surprised by Buble's appearance as they were only told to expect Let it Go singer Menzel on the X Factor stage so there was double the noise as fans began to realise they were about to be treated to a duet. The pair had a great time with the song too as Buble put on different voices which had Menzel giggling away on a number of occasions. In a controversial turn however, Mel B and Cheryl both broke with X Factor tradition by remaining seated while Louis and Simon stood to applaud Buble and Menzel. In the past, whenever guests wrap up their performances, all 4 judges give them a standing ovation but for some reason the two girls did not feel like getting up to show their appreciation. As for the semi final itself, Lauren Platt was beaten out of the show by a resounding performance from Andrea Faustini. 17 year old Platt sang There You'll Be by Faith Hill but she failed to nail the song as everybody would have expected. Faustini however had no such problems with his rendition of Jessie J's Who You Are and he duly survived the the sing off. He will now duke it out with fellow finalists Fleur East and Ben Haenow on next weeks X Factor finale.